The Nextiva App is the primary access point for business users to manage their unified communications solution. It has never been easier to use voice, video, instant messaging and presence services from a single device. Users can access business phone account information and feature settings from their computer, tablet or any mobile device. The app is supported on Windows, macOS, iOS, or Android platforms. 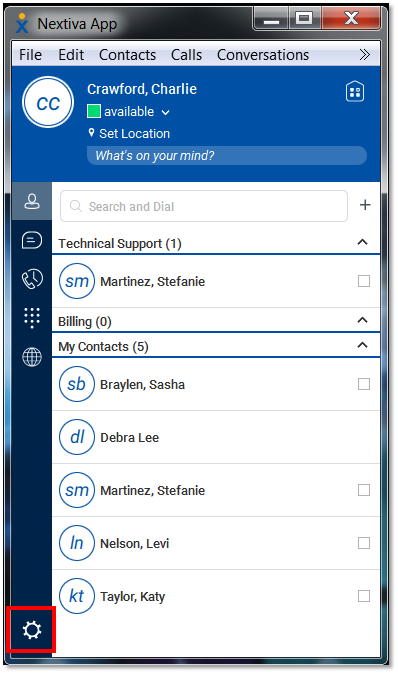 The Nextiva App for Windows and macOS allows you to configure general settings, incoming and outgoing call settings, voicemail settings, change Call Center ACD states, and logging for advanced troubleshooting. 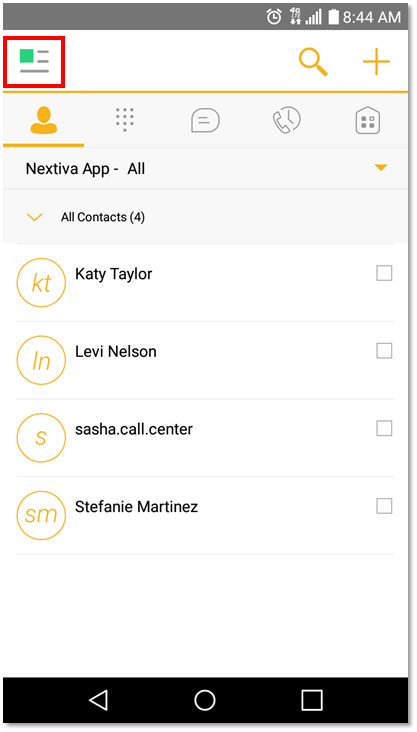 The Nextiva App for Android and iOS allows you to have a similar, more streamlined experience with only the most commonly used call settings like Do Not Disturb, Call Forwarding, as well as logging for advanced troubleshooting. In this article, we will explore each option within the drop-down menus. To jump to the section for General Settings click here. To jump to the section for Media configuration click here. To jump to the section for Incoming Call settings click here. To jump to the section for Outgoing Call settings click here. To jump to the section for Voicemail settings click here. To jump to the Services section for Call Center ACD states click here. To jump to the section for Advanced settings click here. To jump to the section for Call Settings click here. To jump to the section for Preferences click here. To access the Options section for Windows and macOS, click the Options icon in the bottom-left corner of the app (Figure 1-1). To access the Options section, or to change your status from Available for iOS and Android, tap the Team Presence icon in the upper left of the screen next to your Team Presence (Figure 1-2). From here, you can tap your name to change your Team Presence. Under General, Users can customize login preferences to save your password or sign in automatically. You can also customize whether you would like to be asked before deleting contacts, history info, publishing your location or ending a call/chat communication, to be sure you do want to make the change. There are also Accessibility options to assist with using the app (Figure 2-1). NOTE: There is no save button; updates are saved automatically. 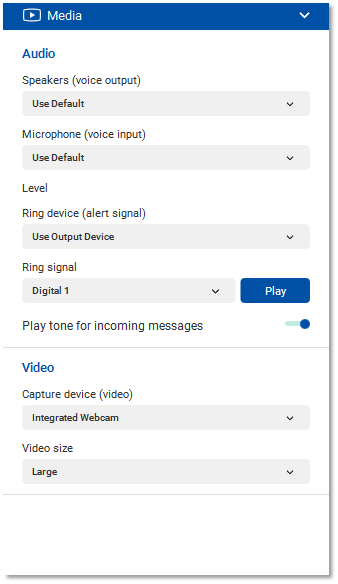 Under Media, Users can choose input and output settings for both speakers and microphone, ringtone and volume settings, as well as video capturing settings (Figure 3-1). All other options are configured according to recommended settings. Under Incoming Calls, Users can turn on/off Do Not Disturb, setup Simultaneous Ring, and change Call Waiting options. 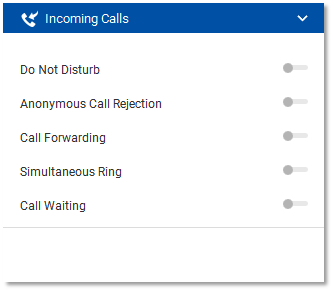 Recently, more settings have been added, including Anonymous Call Rejection and Call Waiting (Figure 4-1). 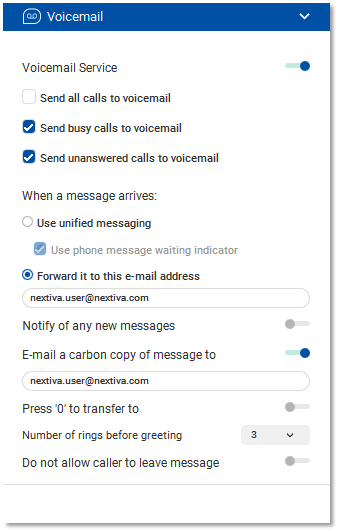 Automatic Callback: If you are calling another Nextiva User at your company and you are in the same Group/Location as the User, you can receive an automatic callback if you call a person who is already on a call. This allows you to receive a call-back reminder to your phone as soon as the busy party ends their call, or Do Not Disturb is turned off. The system will monitor the busy party for the next 30 mins to determine when/if they become available. NOTE: This only works if Users are at the same location and are all under the same account, with a maximum of 30 minutes waiting. 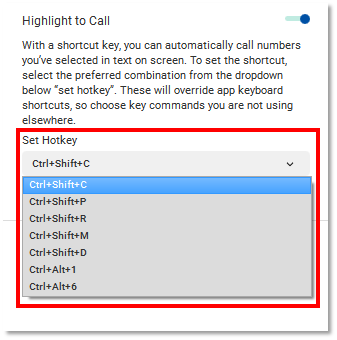 Highlight to Call: If you have your App open and highlight a phone number, you can assign a Short key/Hotkey, which will activate an outbound call to the highlighted phone number instantly. You can choose from the options in the Hotkey drop-down (Figure 5-2). NOTE: To use the feature, highlight any phone number on your computer and push the Hotkey you picked. In the example above, Ctrl+Shift+C is the Hotkey. This feature works within browsers, email, and even MS Office. Block My Caller ID: To hide or mask your outbound caller ID, activate Block My Caller ID and make a call out. 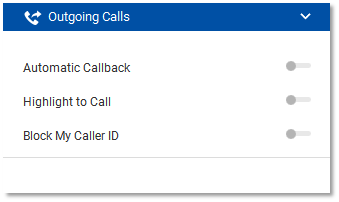 To the receiving caller, your Caller ID will show as Unavailable if this feature is enabled. 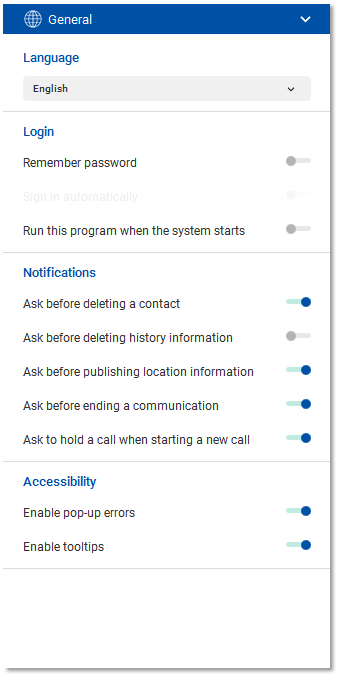 Under Voicemail, many popular User-level voicemail configurations can be accessed via the App, including settings for voicemail to email, rings before greeting, and “Press ‘0’ to transfer” during the voicemail message (Figure 6-1). 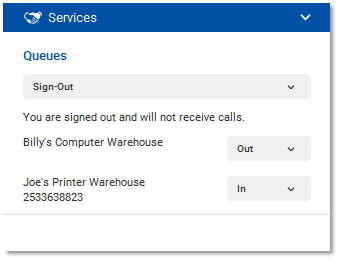 NOTE: The User signed into the Nextiva App must have a Call Queueing, Call Center Pro, or Call Center Enterprise license to see this setting. If missing, check the licenses assigned to the User. Under Services, Call Center Agents have an access point where they can change ACD statuses on the fly. Users can join and leave Call Centers they have been assigned to (Figure 7-1). 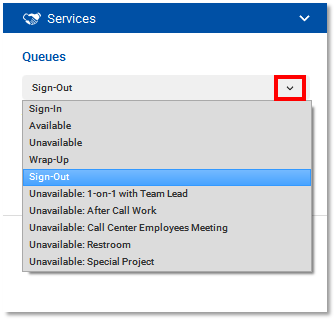 Once an Agent is joined to a Call Center, they can sign in and go Available to take calls, sign out in Unavailable for meetings and breaks, and sign out of the queue to leave for the day (Figure 7-2). 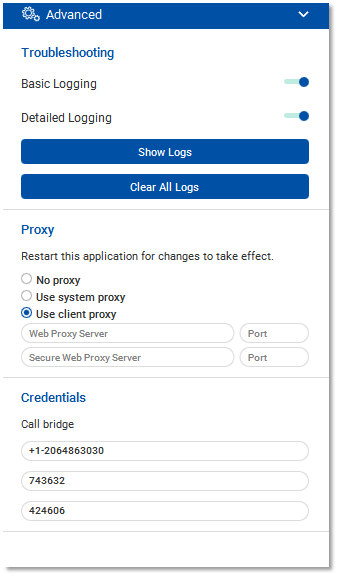 Under Advanced, there is Logging details, Proxy configuration options, as well as a section to show your Meet-Me Conference room details (Figure 8-1). 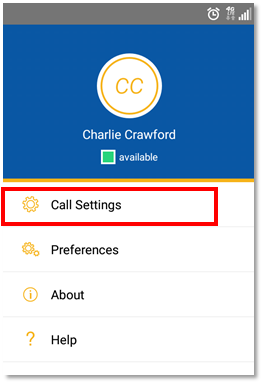 The streamlined options in the Nextiva App for Android and iOS offer access to the most commonly used Call Settings. To access the Call Settings section for iOS and Android, tap the Team Presence icon in the upper-left of the screen, then tap Call Settings (Figure 9-1). Do Not Disturb: Enables/disables Do Not Disturb. 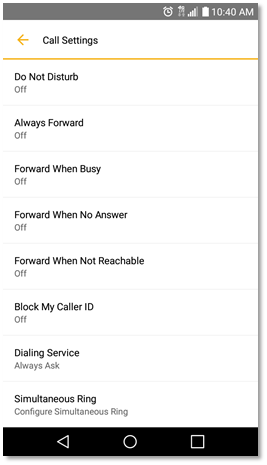 Call Forward Always: Forwards all incoming calls to an extension or phone number. Call Forward When Busy: When on the phone or in a Busy state, forwards calls to a specified extension or phone number. Call Forward When No Answer: If an incoming call is not answered, forwards to a specified extension or phone number. Call Forward When Not Reachable: If not signed into the Nextiva service, or if your business experiences Internet/power loss, forwards to a specified extension or phone number. Block My Caller ID: Blocks your number from showing on the receiving end of an outgoing call. Dialing Service: The Nextiva App can make calls in a number of ways. Internet Call (VoIP), Call Back, Call Through, This Phone, and an option to always ask for each outgoing call are available. Simultaneous Ring: Allows multiple phones to ring when an incoming call is received. This Phone Number: Shows the phone number (if applicable) of the mobile device running the Nextiva App. 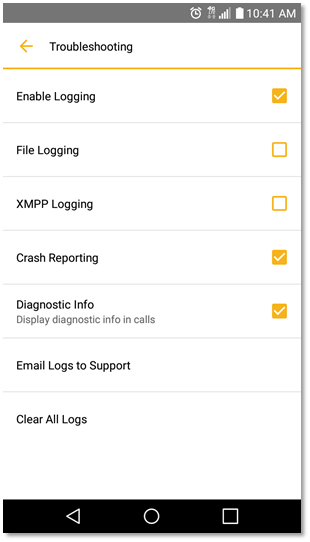 The streamlined preferences in the Nextiva App for Android and iOS offer access to remembering the password on the device, logging, crash reporting and additional diagnostic information. With the wide variety and styles of Android and iOS devices, these troubleshooting options may come in handy when diagnosing application issues (Figure 10-1). For additional questions, contact our Support Team at support@nextiva.com, Submit a Ticket, or give us call at 800.285.7995.